Yachts Cancun Luxury Charters, the leading yacht charter company in Cancun to provide private luxury yacht charters for vacation and special events. CANCUN, Mexico - Oct. 11, 2017 - PRLog -- Yachts Cancun Luxury Charters, the leading yacht charter company in Cancun to provide private luxury yacht charters for vacation and special events, has announced it will offer an all-inclusive deep sea fishing tour in Cancun and the surrounding destinations of Riviera Maya at competitive rates on the occasion of Halloween. The company will offer custom arranged fishing boat charters for visitors to help them have the perfect fishing experience when they come to Cancun to celebrate Halloween with their friends and or family. Deep sea fishing in Cancun is the perfect way to explore the natural underwater valleys of Cancun and satisfy your crave for fishing big game fish. Yachts Cancun Luxury Charters has an experienced crew who will be there to help you catch trophy fish while deep sea fishing. The team fish the best fishing spots and will tell you when and how to reel in the big fish based on your existing knowledge. They own and maintain their own fleet of fishing boats that are fully equipped with fishing equipment, fishing bait, accommodation and other entertainment facilities. The waters surrounding Cancun attract anglers from all over the world who wish to catch their favorite fish, especially in the waters of Isla Mujeres when it comes to chasing Billfish, Dorado, Wahoo and Tuna, just to name a few. There is a wide variety of fish species found in Cancun, from barracuda and marlin to catfish and roosterfish. Some of the fish species that you can catch in deep waters include Blue and White Marlin, Mahi Mahi, Bonito, Tuna, Wahoo, Sailfish, Barracuda, Catfish and Tuna. However, catch and release is recommended for some game fish. The guide will tell you which catch is free for you to take and allowed for consumption. Any edible catch will be cooked for you in your style by an expert chef on board your own private fishing boat charter. A senior official at the Public Relations department of Yachts Cancun Luxury Charters commented: "As a premier yacht rental company in Cancun & Riviera Maya, we believe in providing our clients with a perfect charter experience. Our inclusive Cancun fishing charter package will include an experienced captain & crew, fishing tackle, bait, Mexican fishing license, drinks, food from an onboard chef, and lots of fun." He further stated, "Since it's the Halloween season, we are offering exclusive fishing tours in Cancun with guaranteed catch and lots of entertainment – everything at competitive rates that you cannot find elsewhere." Yachts Cancun Luxury Charters is recognized as Mexico's leading company in private luxury charters and yacht events. Their team of licensed fishing guides and experienced crew specializes in providing a world-class fishing experience for both novice and experienced anglers. Their exclusive yacht Cancun fishing charter will be customized to exceed each customers' needs. The company believes that when it comes to customer service, there is no such thing as good enough, and strives to provide the most luxurious yacht rental combined with 5-star service to make your vacation an unmatched experience. 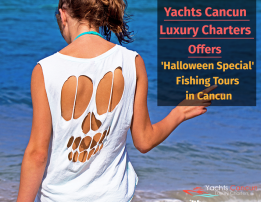 Yachts Cancun Luxury Charters promises its clients to provide an exciting and fun-filled fishing tour in Cancun to celebrate an equally amazing Halloween bash. Yachts Cancun Luxury Charters is a private luxury yacht rental service provider, operating in the beautiful city of Cancun, Mexico. Their mission is to provide its clients with a safe and adventurous encounter with nature. Their wide range of water sports activities in Cancun and its surrounding destinations include Riviera Maya tours, fishing excursions, diving tours, zip line tours and more. Yachts Cancun Luxury Charters pays close attention to clients' vacation needs and are always happy to make helpful recommendations or accommodate any special needs they may have for a memorable experience. Yachts Cancun Luxury Charters Announces Special Couple's Package for "Valentine's Day"